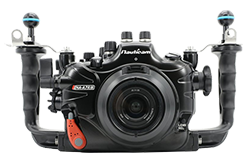 The Nauticam NA-A7R III offers the most flexibility out of any housing brand. With their unique Nikonos adapter you have the ability to use a variety of Nikonos lenses in addition to all the Sony FE lenses, and Canon lenses with Metabones adapter. This housing is machined from high-quality aluminum, features access to all camera controls and a plethora of great accessories, including their water contact optics like the SMC & WACP lenses. Optional flash trigger is available. The Aquatica Housing for Sony A7R III has been completely rethought to make one of the smallest and lightest housings Aquatica has ever released. The A7R III housing is 12% lighter than the Aquatica A7R II housing and controls have been updated for better response and easier use. It has a rugged powder coated finish to withstand rough ocean conditions and is machined from aircraft grade aluminum, built to last. The Ikelite Housing for Sony A7R III is a great quality polycarbonate option, perfect if you are on a budget. The stronger alloy used for the new DryLock housings allows for a deeper depth rating and better ergonomics. 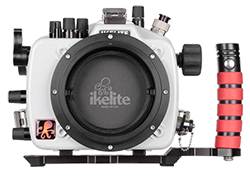 Ikelite still has the see thru back, allowing you to see your o-ring seals. Both Sony & many Canon lenses (with Metabones adapter) are supported in this housing. In addition, the Ikelite A7R III is also compatible with Sony's professional mirrorless camera, the Sony A9. Optional TTL converter for use with Ikelite Strobes. The Sea & Sea Housing for Sony A7R III offers high-quality construction, full camera control and more. Sea & Sea is well known for its quality Optical YS Converter - TTL control through fiber optic cables with Sea & Sea strobes. In addition, a new buoyancy pocket helps level out the housing buoyancy underwater and allows for the addition of a battery pack to improve longevity while diving. The Sony A7R III camera builds upon the high-end Sony Full Frame mirrorless line with some great improvements over the previous A7R II. The most important to many underwater photographers is the increase in battery life - nearly double that of the A7R II. In addition, the A7R III offers a dual card slot, 10fps burst shooting, improved image stabilization, and video features. 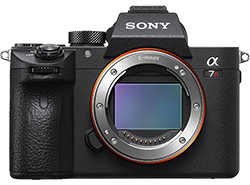 Check out our review below for the complete information on the many improvements featured in the Sony A7R III.